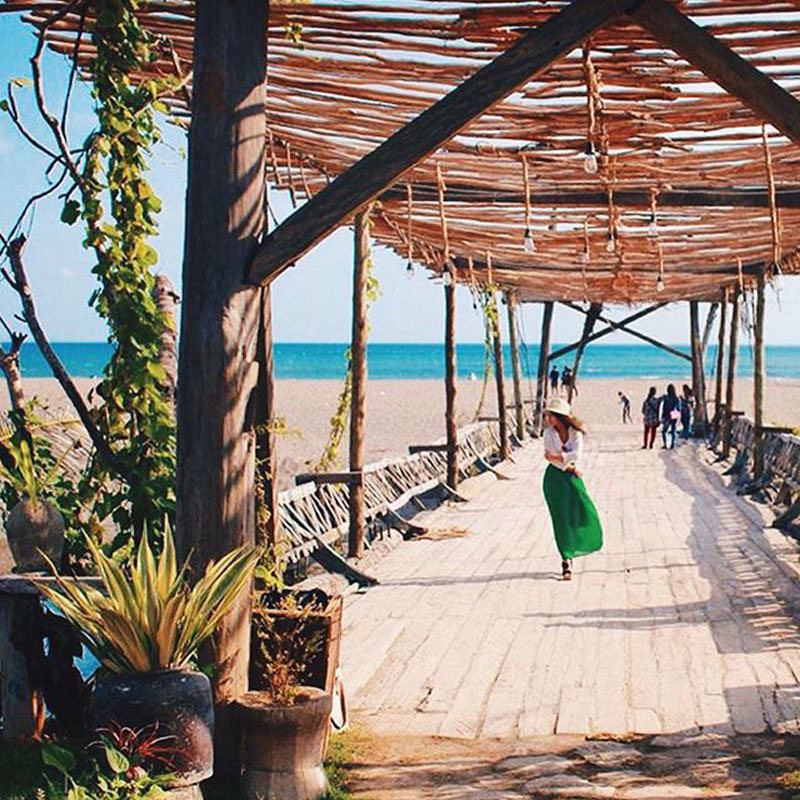 Tired of all the surfing, snorkelling and touristy resorts in Bali? 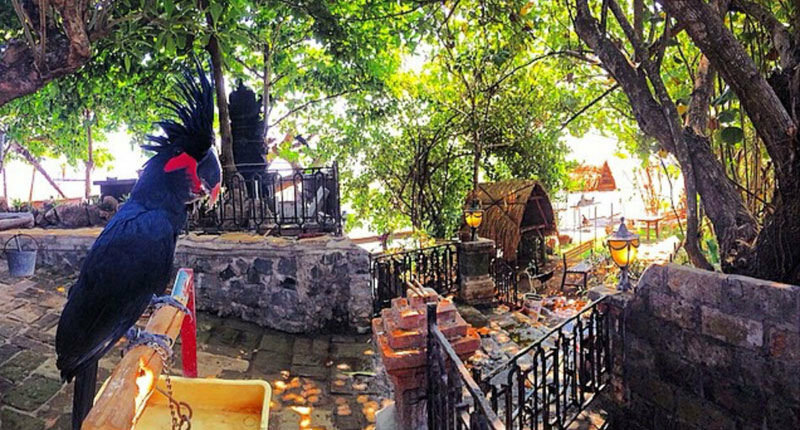 Are you craving for your own quiet little corner where you can watch the world go by? 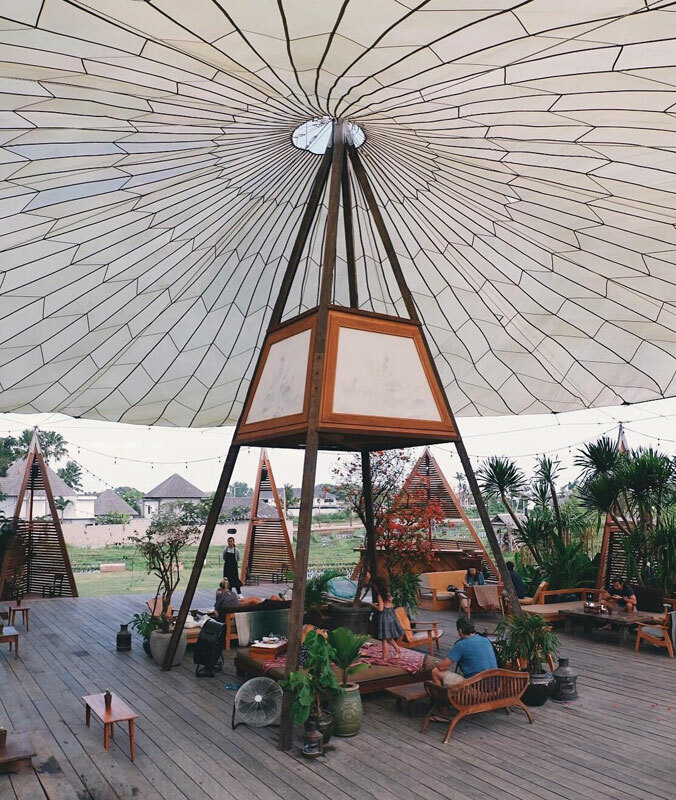 Set beneath a huge vintage parachute, this delightfully unique café boasts a stunning location amidst rice paddies that give off a distinctly carefree, laid-back vibe. 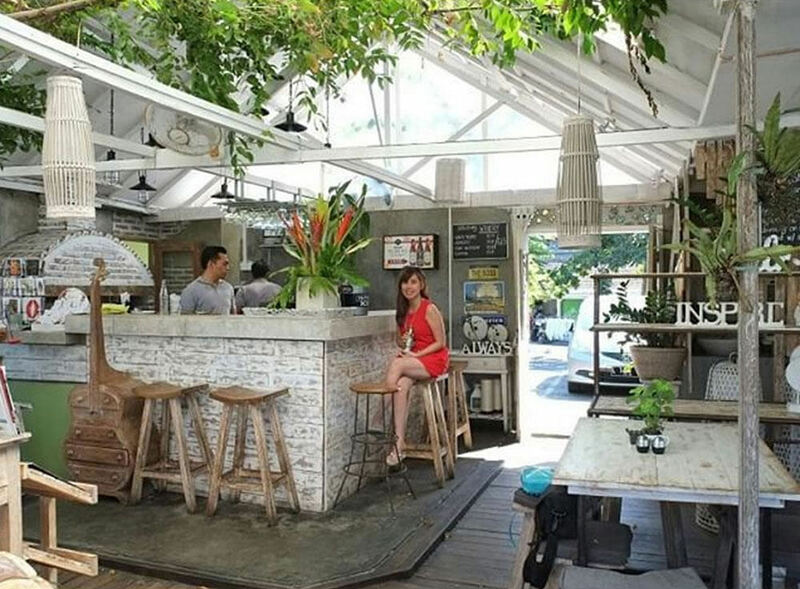 But not only is this cute little café a must-visit during the day, you can come back at night under the stars (and the strings of fairy lights that illuminate the patio) to take advantage of their scrumptious dinner menu. Add a delicious drink on the side and you’re all set for a perfect evening! 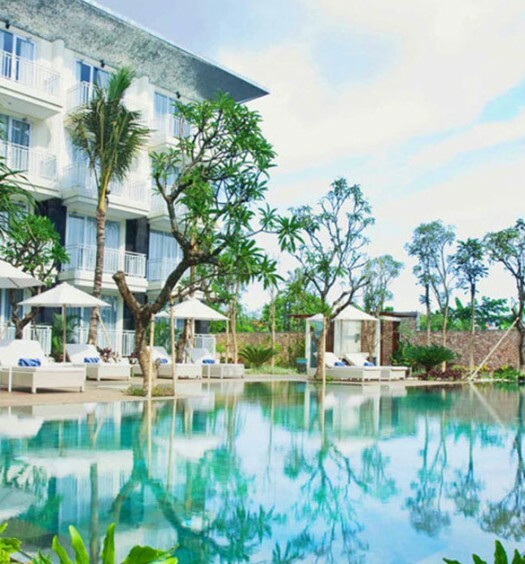 Stay in happening Seminyak 1-7 BR villas! 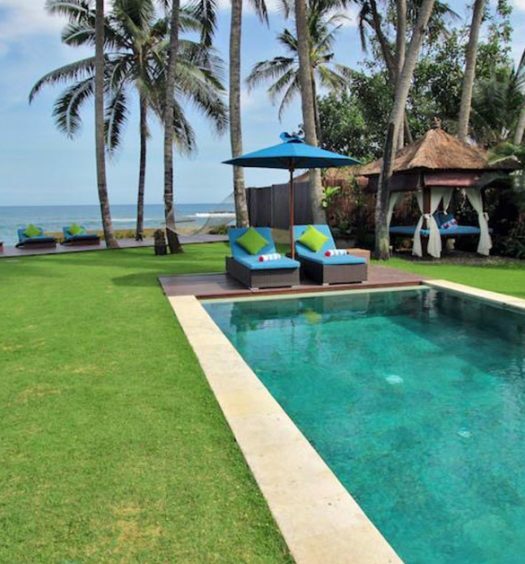 Book your Bali villa (with private pool) getaway! 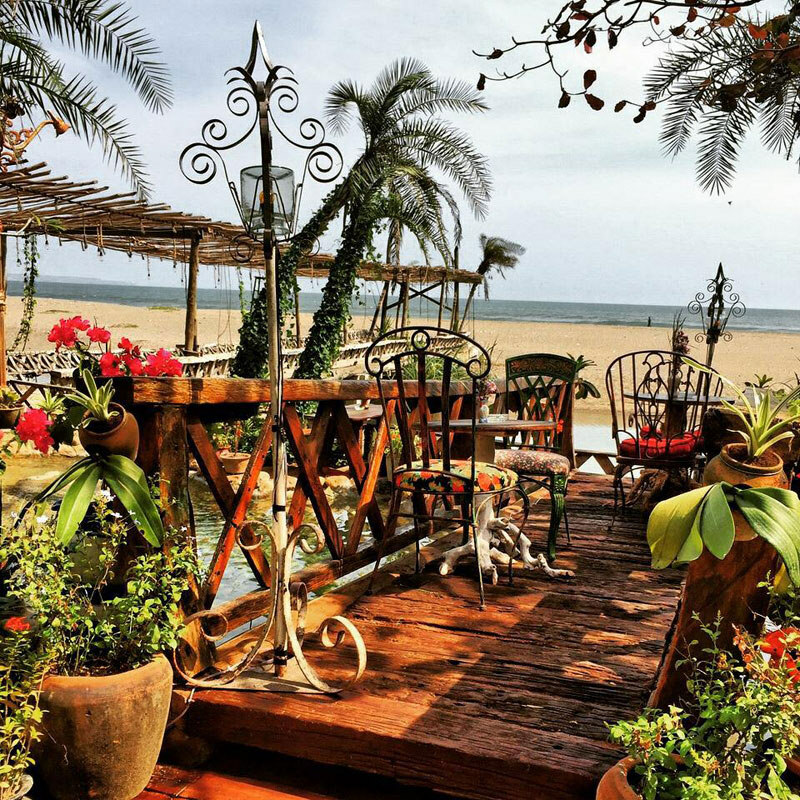 Treat yourself to an exclusive clifftop oceanfront villa stay! 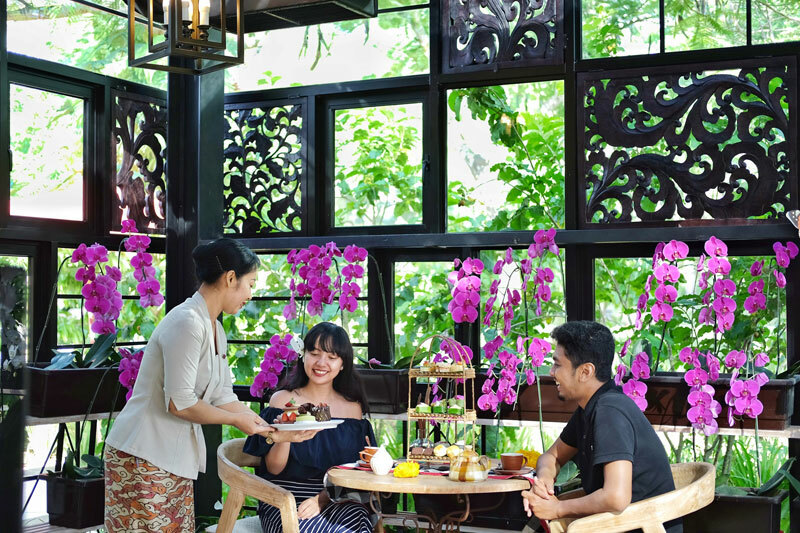 RIMBA’s Orchid Tea Lounge is a bright, dainty café generously filled with (as you may have guessed) beautiful potted orchid flowers. 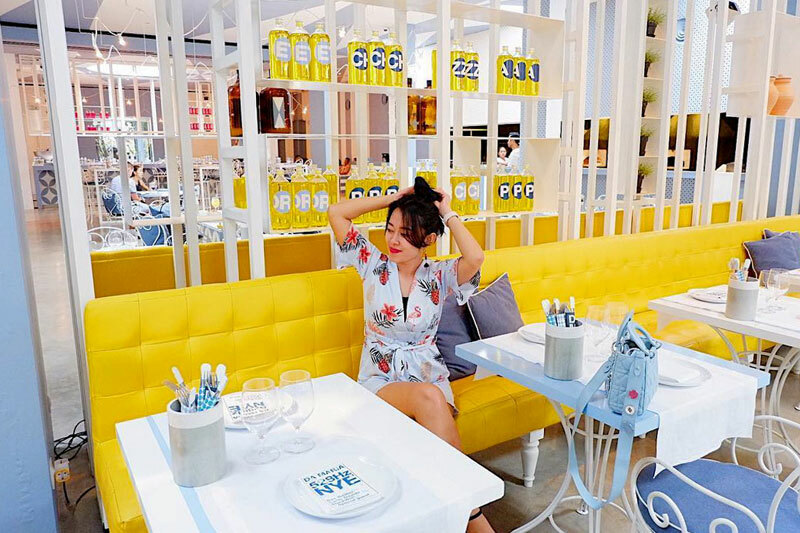 Inside this glass-walled tropical café, you are treated to a relaxing atmosphere that combines the soothing effects of florals with the contentment you feel after good food. 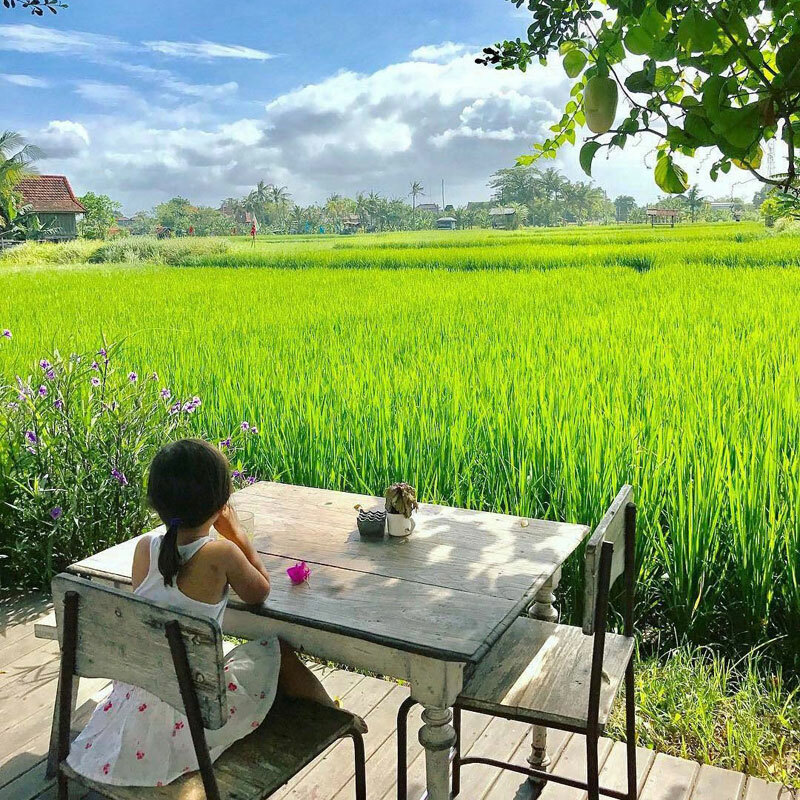 After all, there isn’t a much better way to relax than gazing out the glass windows at the flower fields and rice paddies while munching on tea cakes! 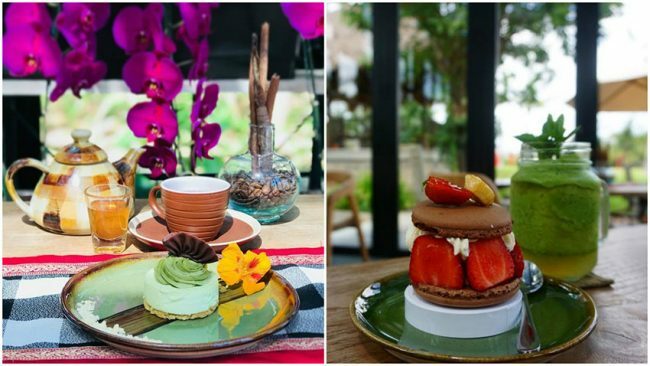 The uniquely-designed, almost-too-pretty-to-eat cakes are a huge hit with patrons and make great Insta-quality photos! 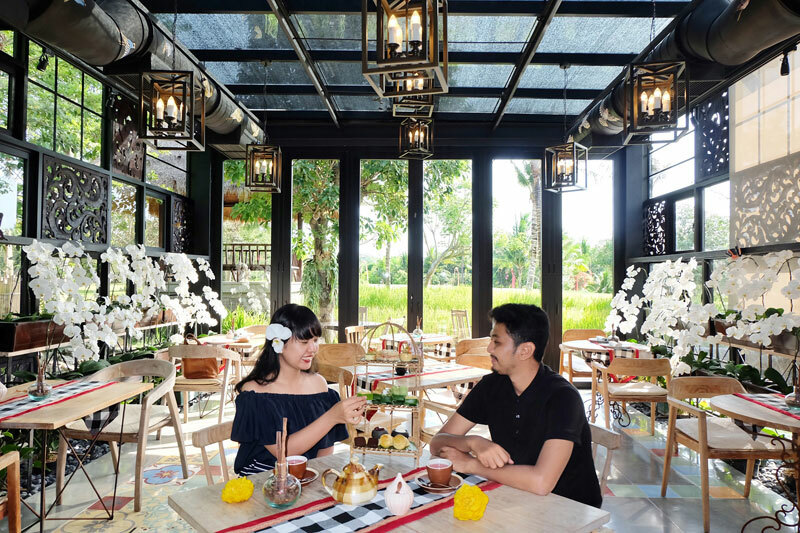 Enter this garden paradise to quench your thirst and sate your hunger with the daily Balinese High Tea, and indulge in the extensive selection of Dilmah tea (green, black, flavoured, herbal, and oolong). If you’re not a fan of tea, don’t worry, you have an array of beverages to choose from – gourmet coffees to chocolate. 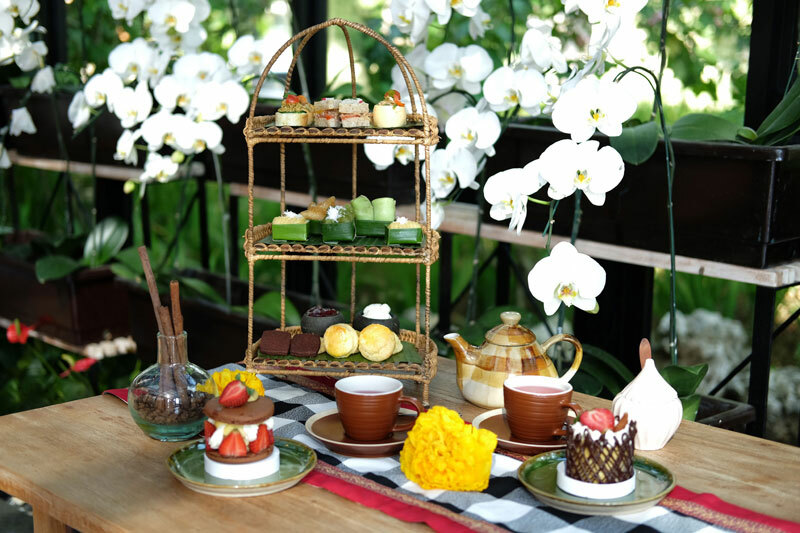 And of course, how can high tea be complete without the little munchies, like sandwiches, cookies, scones and traditional Balinese cake? You’ll never leave here hungry! 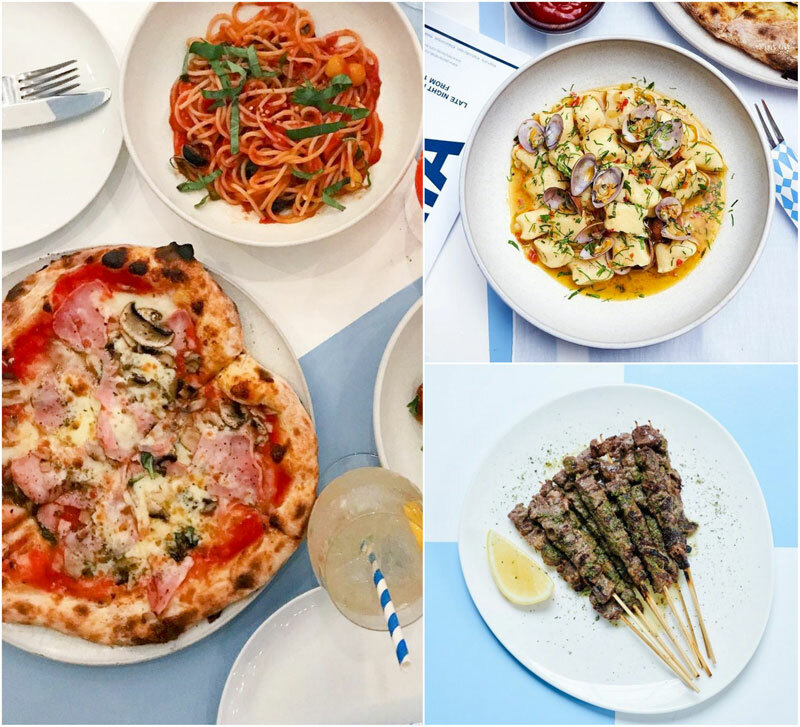 If you want a taste of Italy while in Bali, this is your ticket to some seriously delicious dishes. 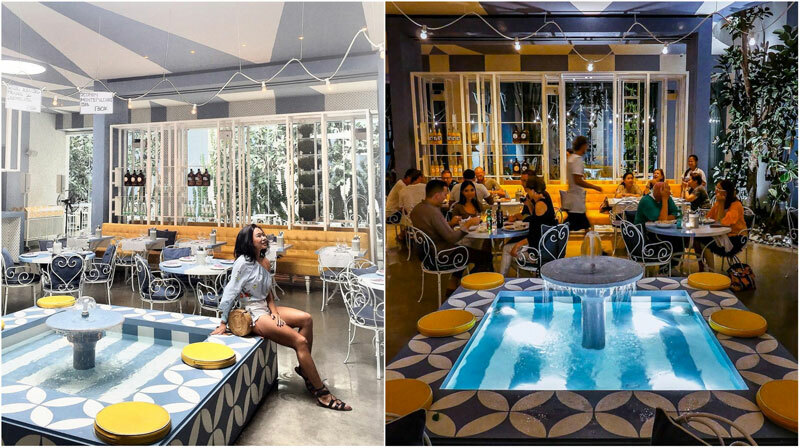 Da Maria Bali, with its refreshing and distinctly Mediterranean colours and interior decor, will give you the impression that you’re dining in the sunshine on the Amalfi coast. 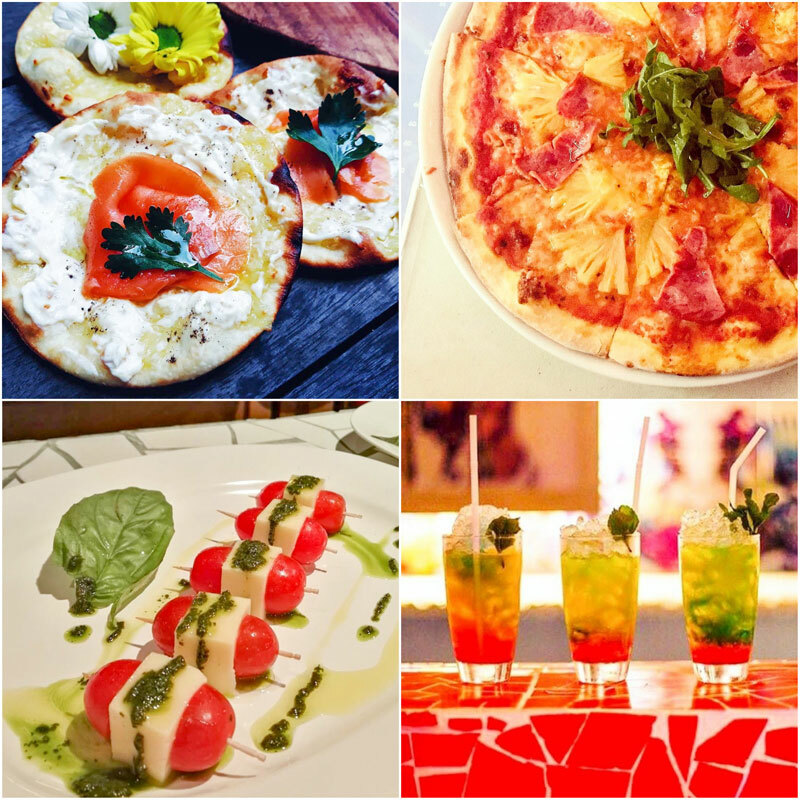 Between scrumptious Italian dishes like flavourful crispy pizza (made in a real brick oven!) and fresh, savoury pasta, we guarantee you’ll leave here already wanting to come back. Don’t skip dessert; the tiramisu is praised by all who try it. 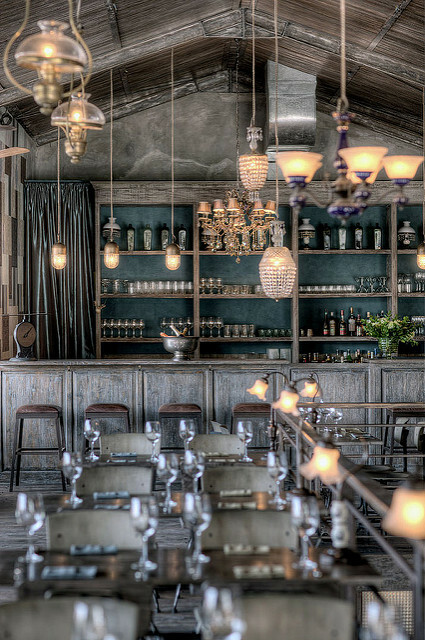 Swing by on a weekend, when the party really starts! 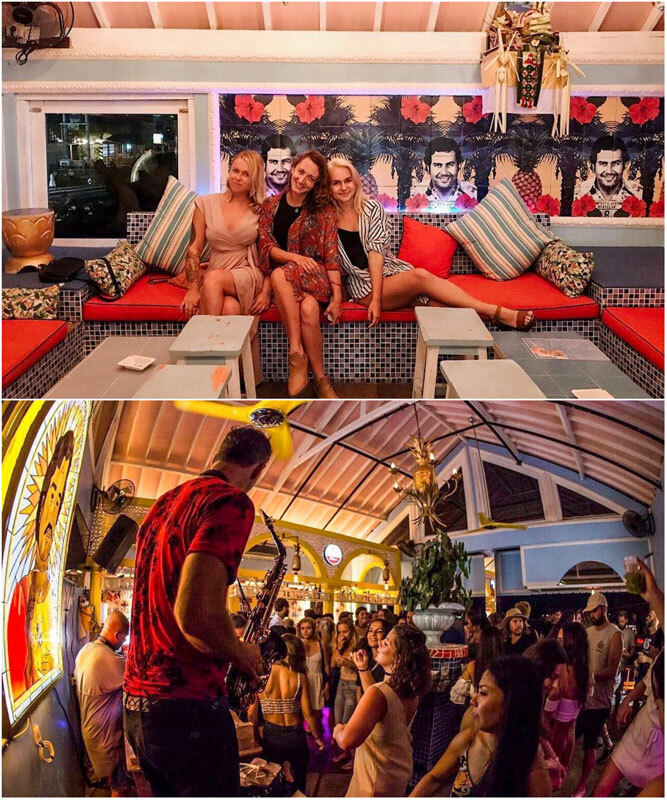 Every Friday to Sunday, the casual feel of dinner gradually morphs into live music and disco after 10pm. 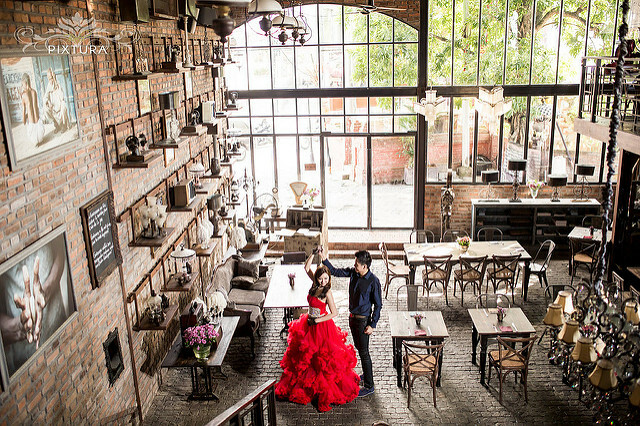 Grab a drink and a dance partner and spend the night partying to tune-spinning by local DJs! Have you ever heard of the saying, “Heaven is a place on Earth”? 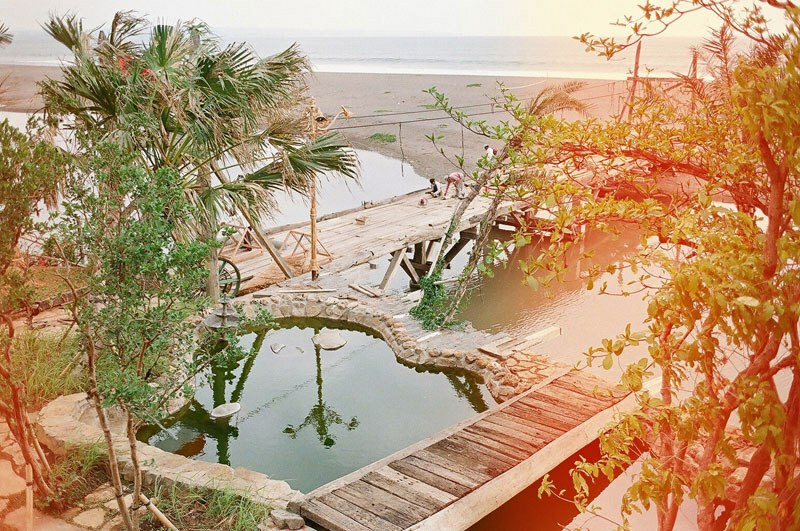 We think it could possibly be Panama Kitchen and Pool! 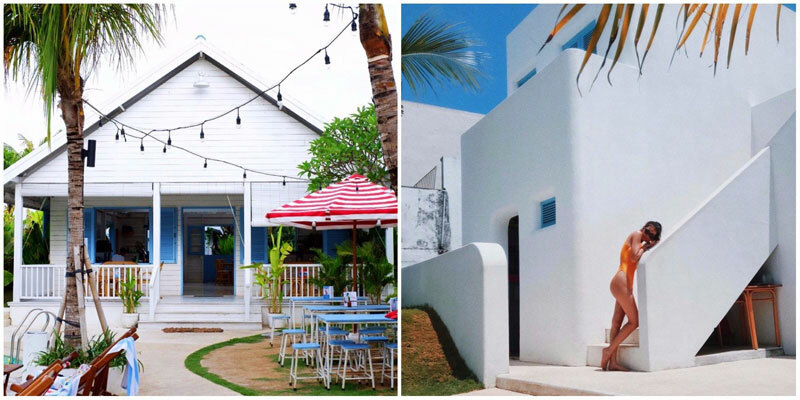 This café in Canggu offers Greek-like scenery with whitewashed walls and an envy-inducing pool to fulfill your dream vacation to Santorini (without having to leave your Canggu community). How awesome does that sound! What a hipster time to be alive! 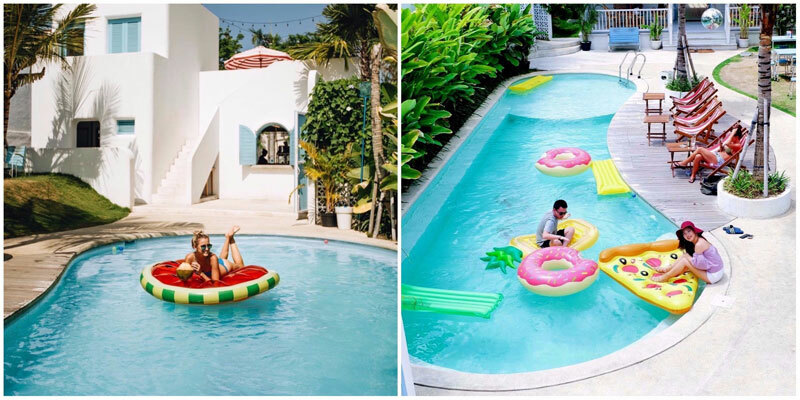 Envision a cozy environment, enhanced by a pool with the trendiest pizza and donut-shaped inflatables, juicy burgers and the wildest variety of cocktails, mocktails and milkshakes. 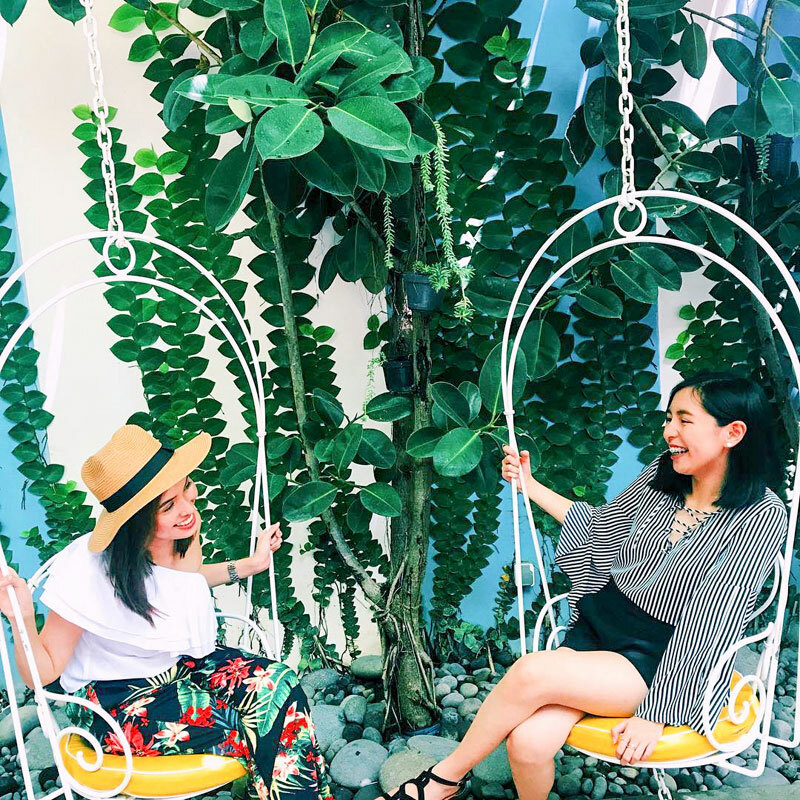 In Canggu, some days we eat healthy but some days we rely on water, especially frozen into ice cubes and blended with tequilas; we love Margaritas! 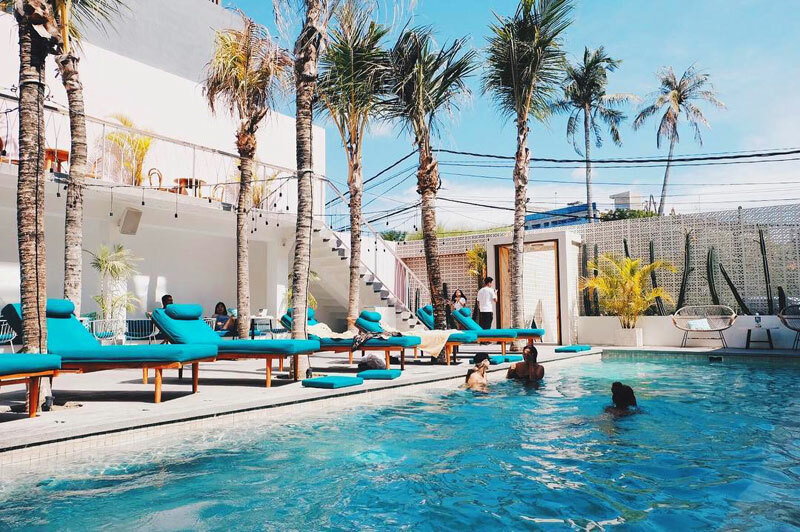 If there’s something not to miss at Panama Kitchen and Pool, it is definitely their Margaritas (rated the best in Bali, by many); oh yes they’ve got Margaritas colder than your ex’s heart! Coffee time is meant for coffee only said no one ever! 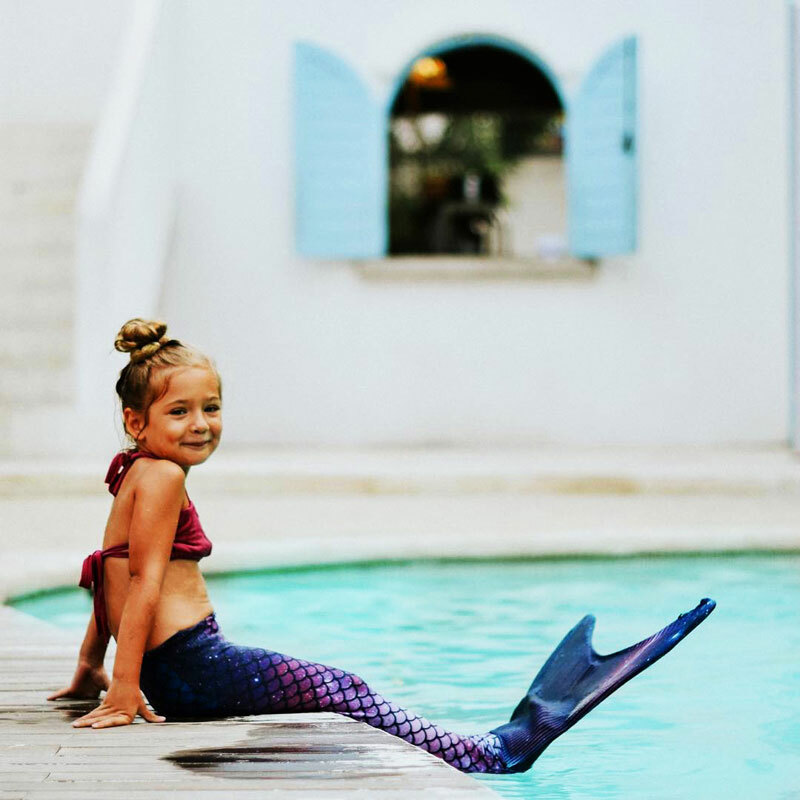 Do you have a little mermaid in your family? She would be a very happy fish in water at the Mermaid Swim Club every Sunday, with a mermaid tail provided! 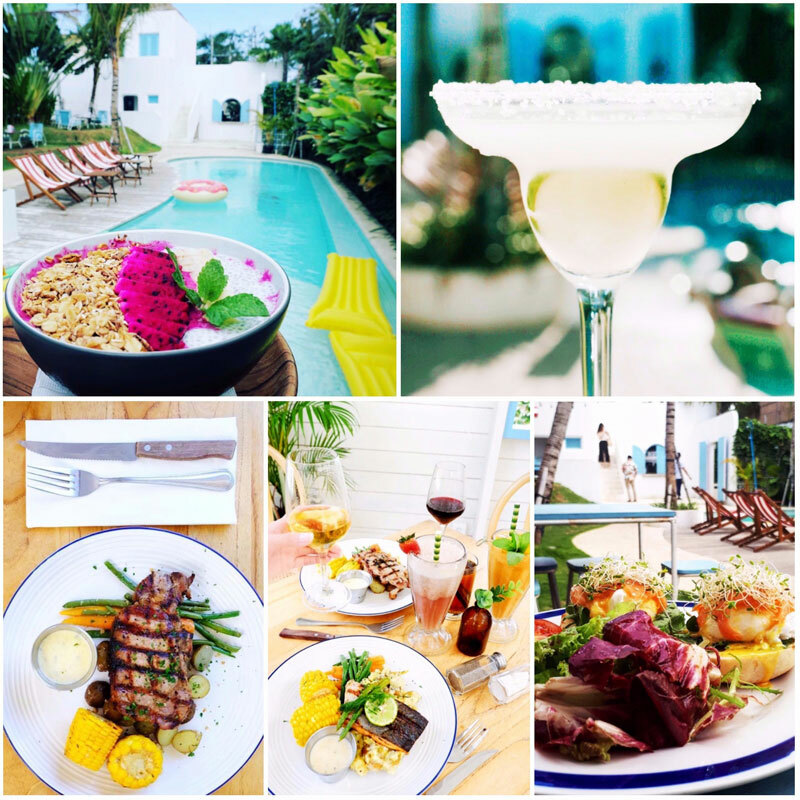 Panama Kitchen and Pool is definitely somewhere you wouldn’t mind spending the entire day at – we’ll let the pictures speak for themselves! 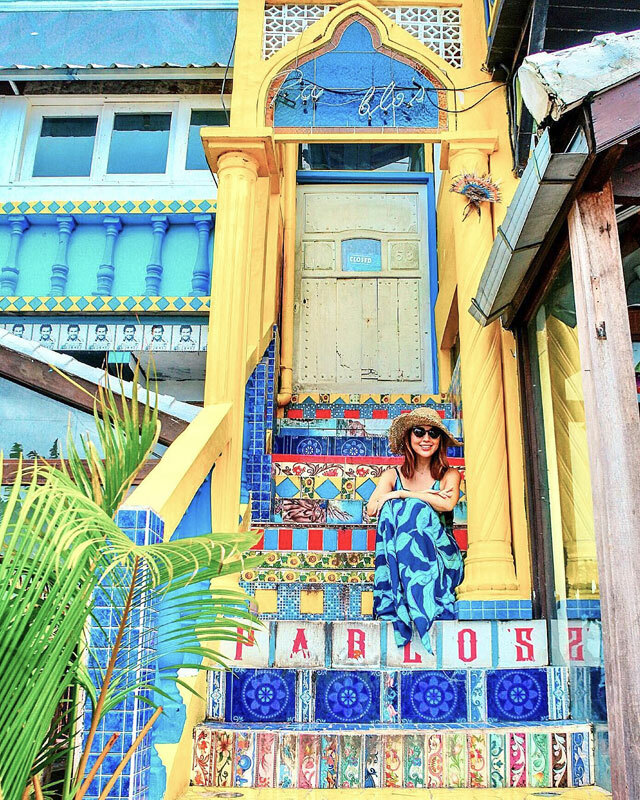 Keen to add some pink to your Instagram feed? 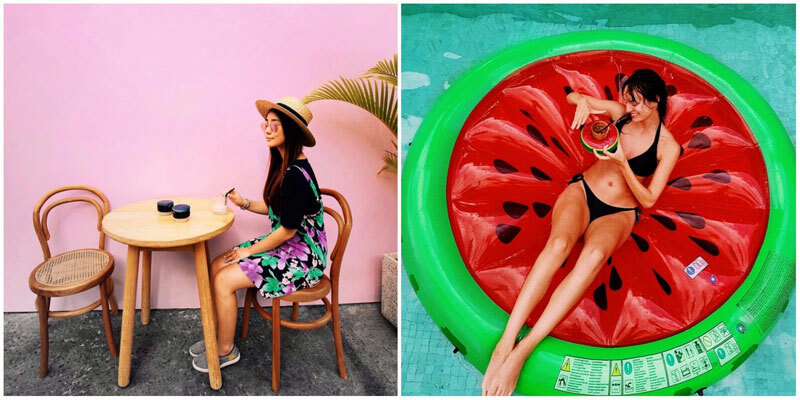 How about lazing on a watermelon float in the café pool along with a killer pink backdrop and a Palm Springs-like setting? 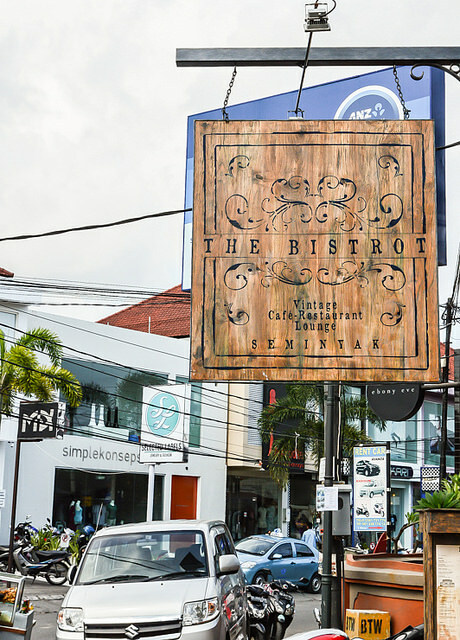 Time to brag about your Bali holiday sweetheart because this place is a little gem only a few know about! 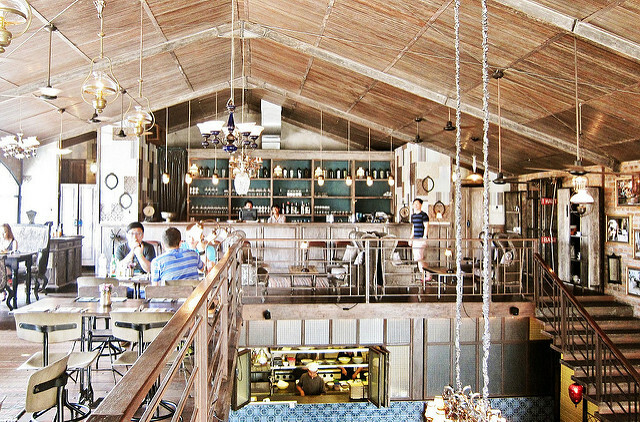 Cabina Bali is good at bringing back teenage memories. 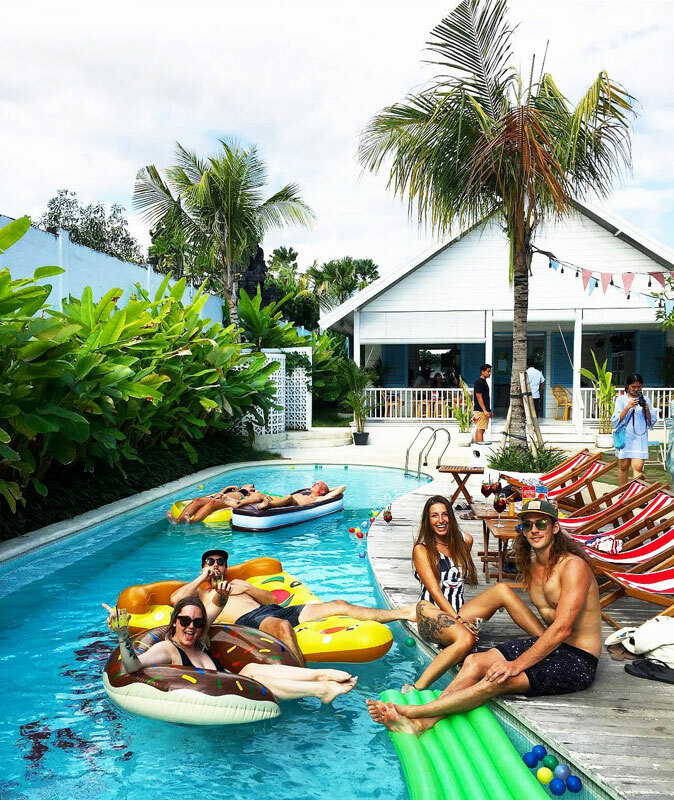 With its signature pool and good music, you’ll be transported back to the days where open-house pool-chilling sessions were part of your weekend plans. The American-dream setting is enhanced by cactus plants against light-colored walls, old-school rattan chairs and beautiful blue-hued lounge chairs by the turquoise pool. 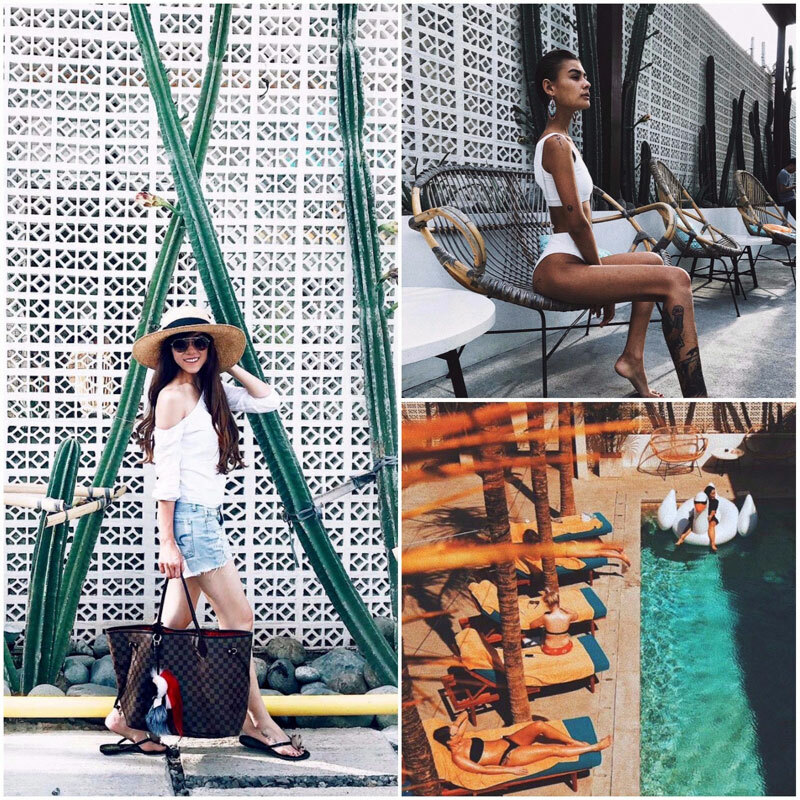 Bring along your #instagramboyfriend and make sure he is the hero behind your Cabina Instagram fame – your followers will be jealous! 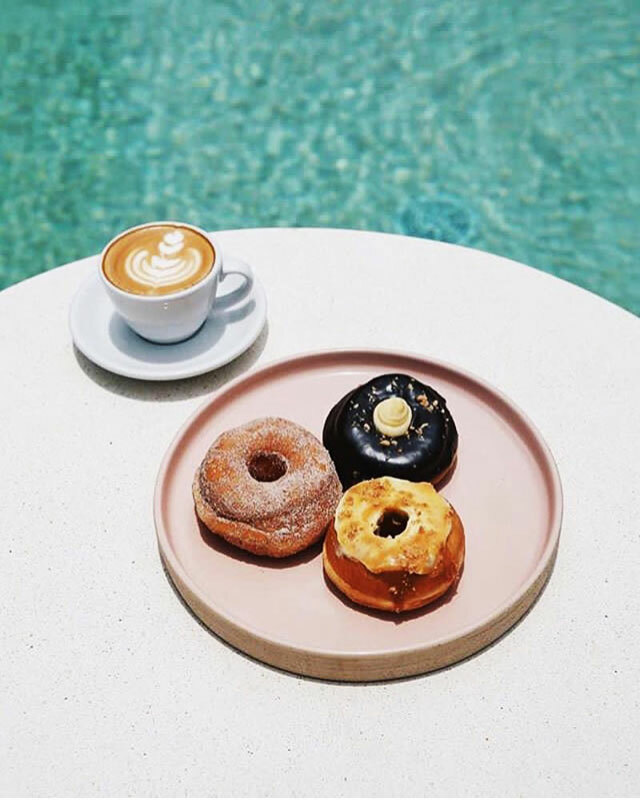 While you’re here, forget about salads for today, we think doughnuts would be the perfect match! 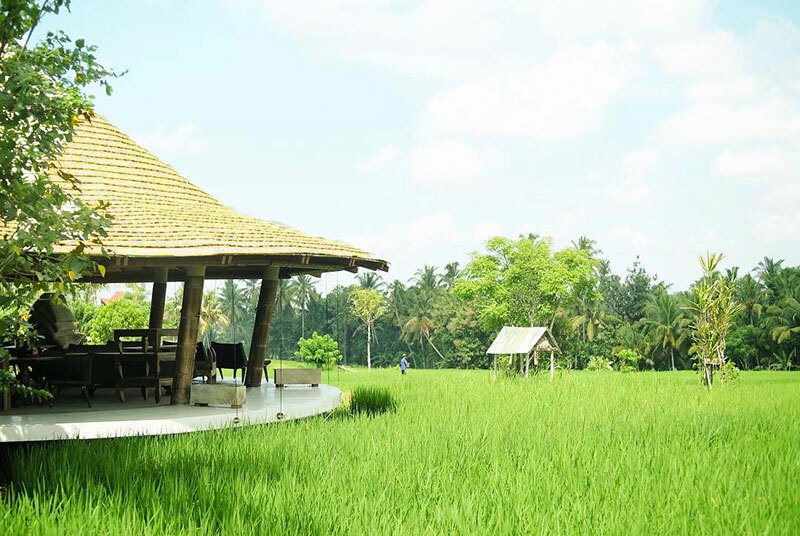 Cabina Bali, in collaboration with Doug Darlings, ensures that this is possible so you clearly donut have to worry! 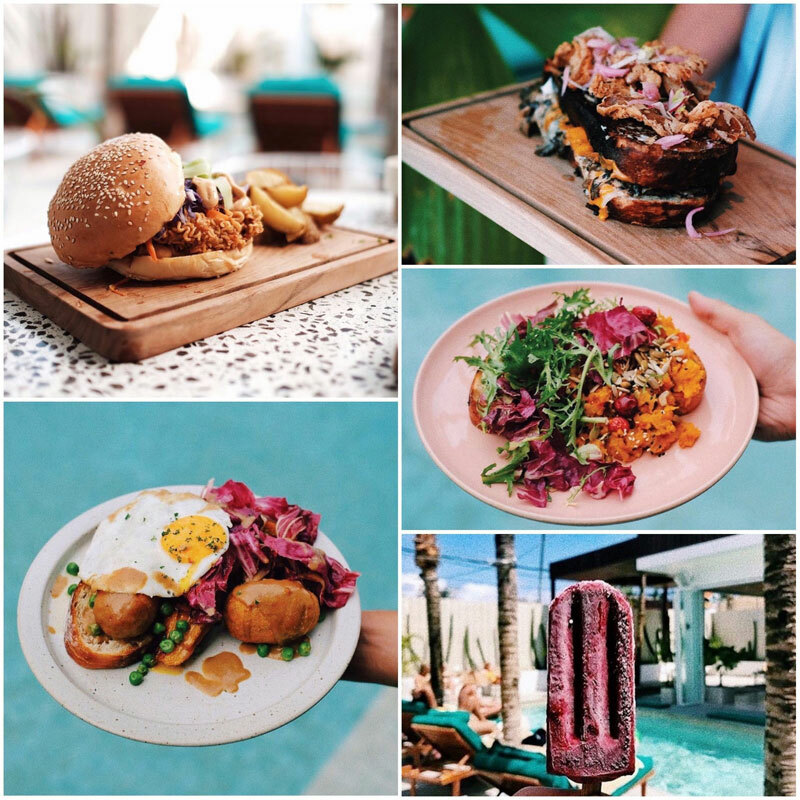 As the latest hit for brunch lately, don’t miss the cheesy nachos and fries or killer chicken wings or wait … Burgers! Burgers are always a good idea. Ice-cream too! And they’ve got you your avocado fix too, so don’t panic! 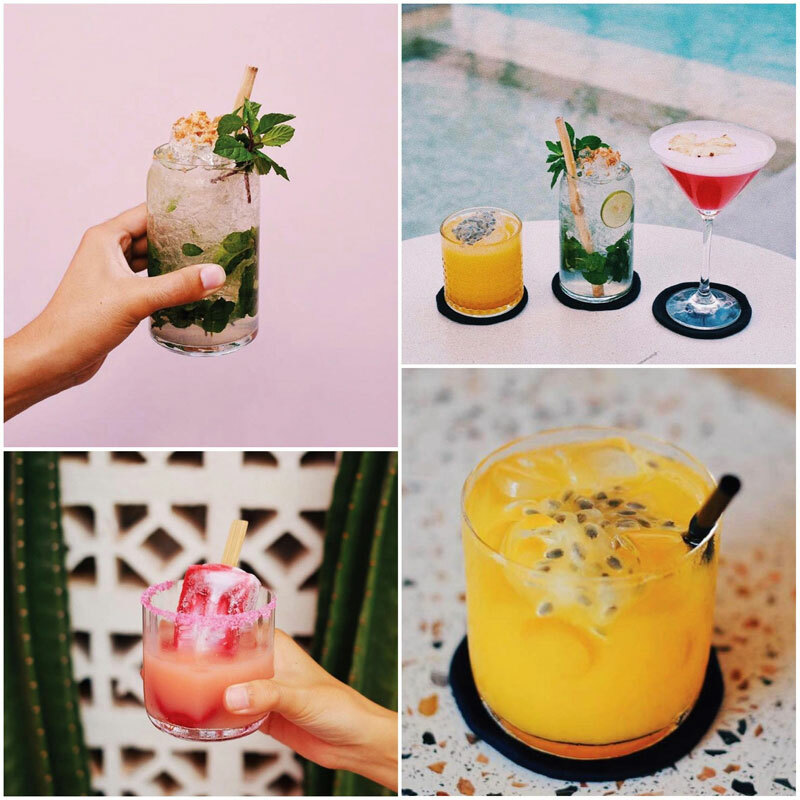 Finally, no meal at Cabina would be complete without the right drink to accompany your food, and believe us this café does it all, from freshly pressed juices to innovative, spunky martinis! Let’s forget about Western sweets because today traditional Indonesian desserts are in the lead! 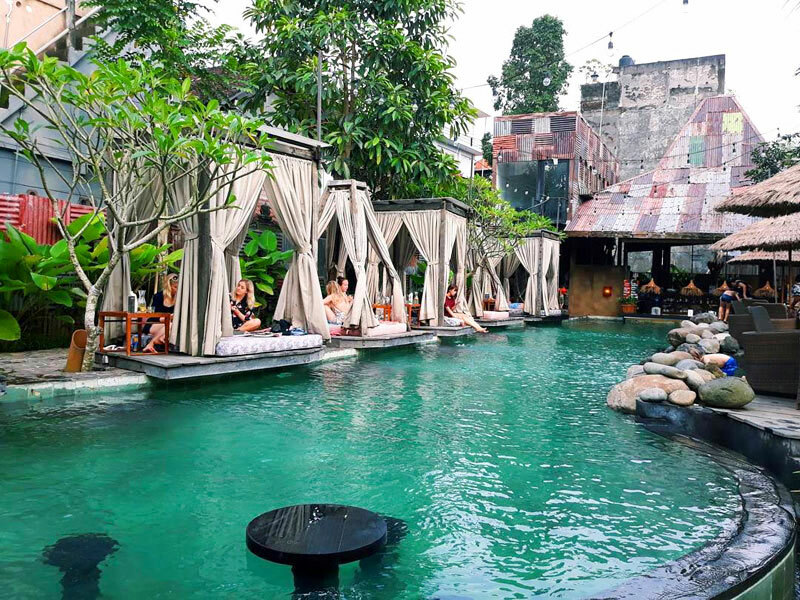 If you happen to be wandering around Ubud and looking for a place to chill at, sip a cuppa and have some delightful treats, don’t miss Folk Pool & Gardens. And yes, you get free access to the pool, which you can jump right into from your private cabana! Time for an explosion of Indonesian flavours! 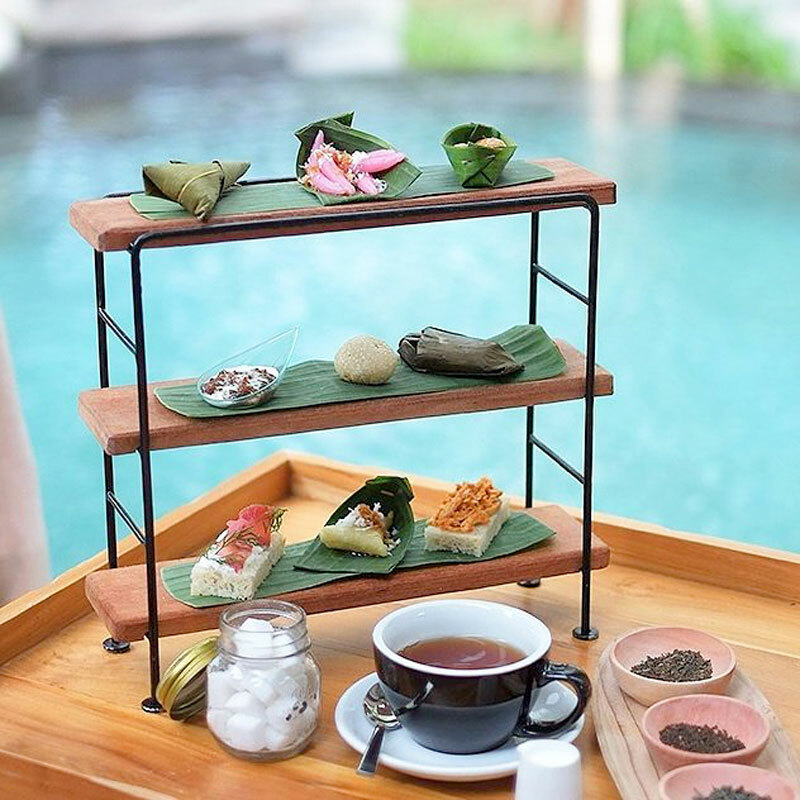 Wrapped in banana leaves and displayed on a three-tiered stand, these Indonesian savouries are real surprises for your palates – each of their ingredients are locally sourced from sustainable partners of the community! 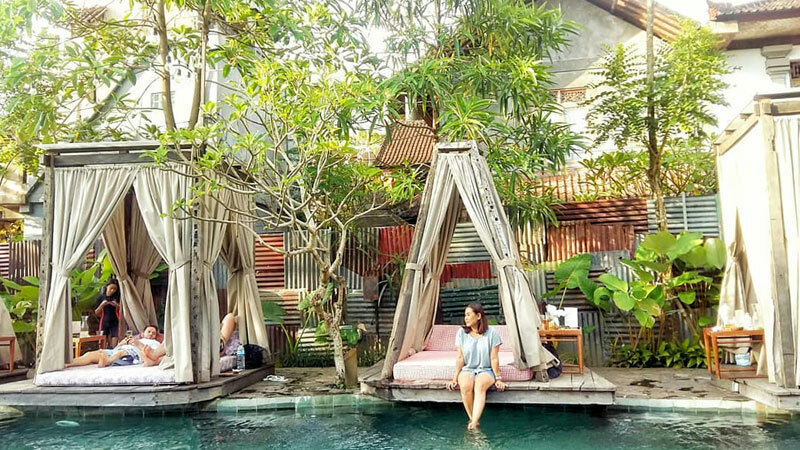 Post-tea time is spent lazing in your private cabana or simply dreaming away on the hammock and multiple colourful poufs by the pool! 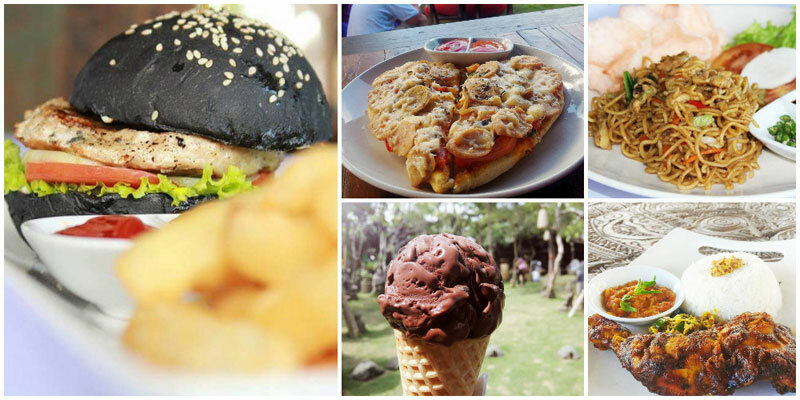 We warned you… forget about your bikini diet while in Bali! 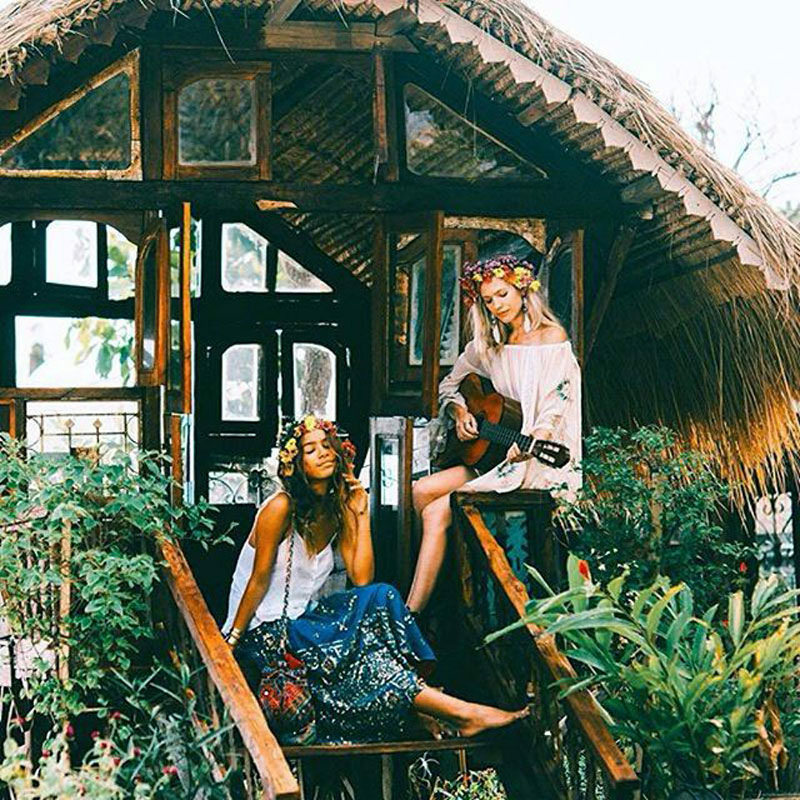 If you feel the gypsy and artsy vibe here, you aren’t the only one – Folk Pool & Gardens is also a place for any boho-soul! 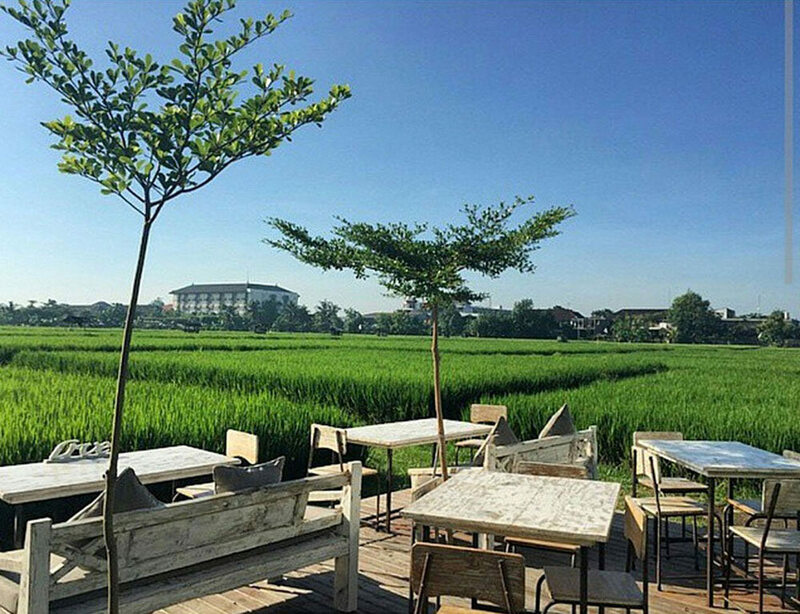 At one of the Denpasar’s busiest traffic junction lies the corner of peaceful paradise. 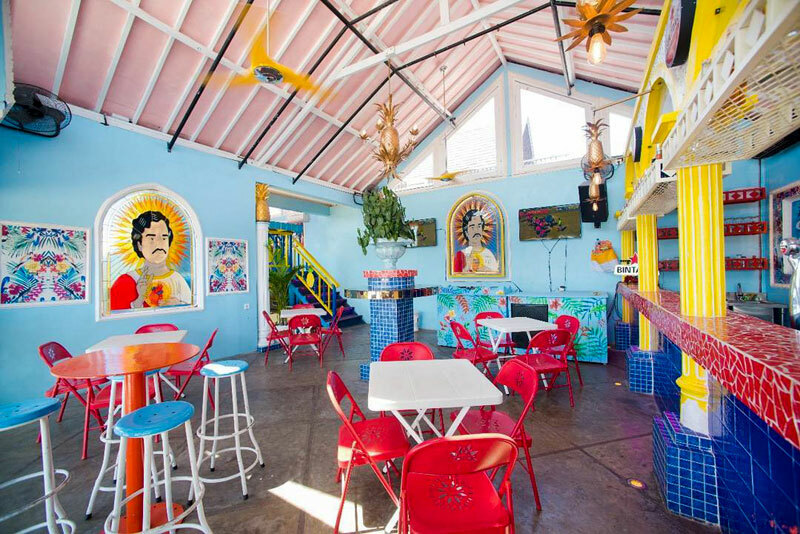 At the Big Garden Corner restaurant, you can have a meal under hundreds of happy colorful umbrellas! 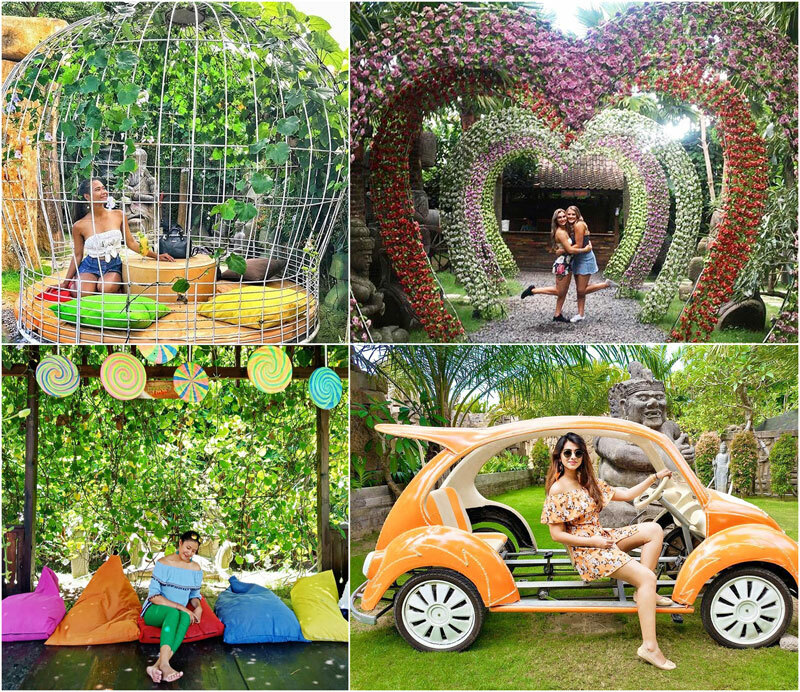 With all these beautiful colours, you don’t even need to use a filter on your Instagram pictures – how photogenic! As for food, the prices are very reasonable. Snacks and drinks offered for breakfast costs only Rp 10,000 (USD $1) onwards, so it’s very wallet-friendly. On hot days, you may want to cool yourself with a glass of fresh juice or some delicious homemade gelato. 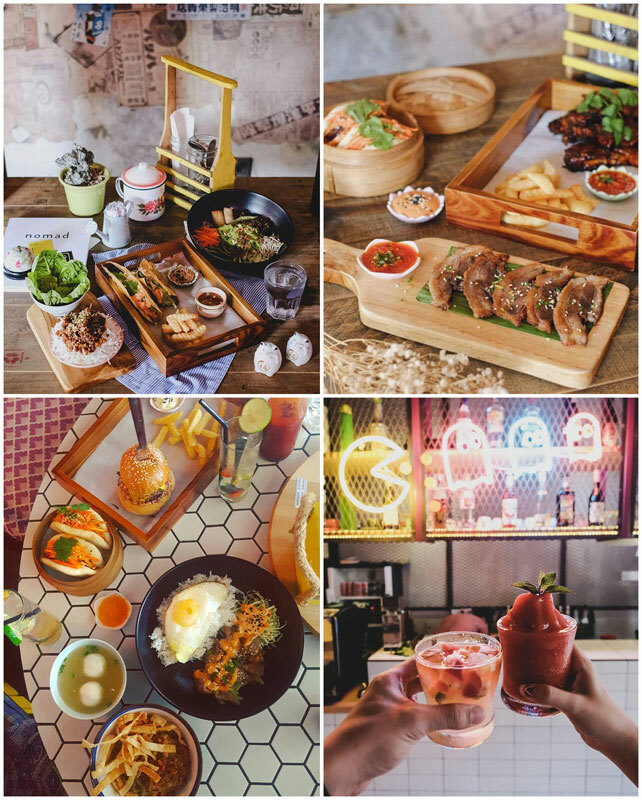 On the menu, it’s mainly Western food such as spaghetti carbonara, chicken cordon bleu, pork ribs, steak and fish. 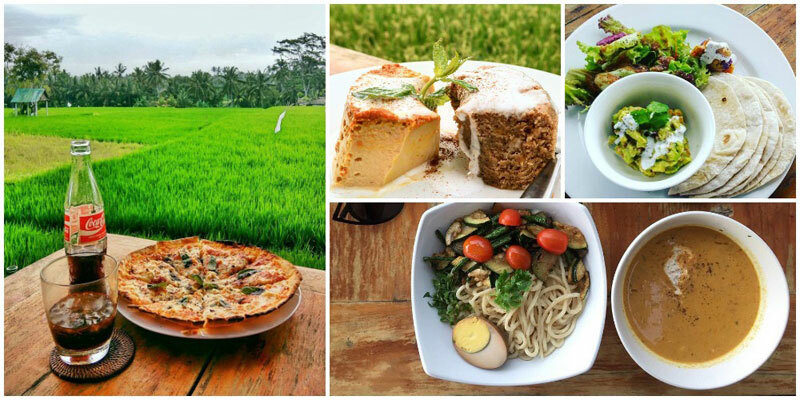 You will be able to find there the typical Indonesian dishes such as Mee Goreng, Nasi Goreng, etc. If you’re looking for something you’ve never tasted before, we recommend you to order The Black Burger. And end your meal with one of their delicious banana dessert. 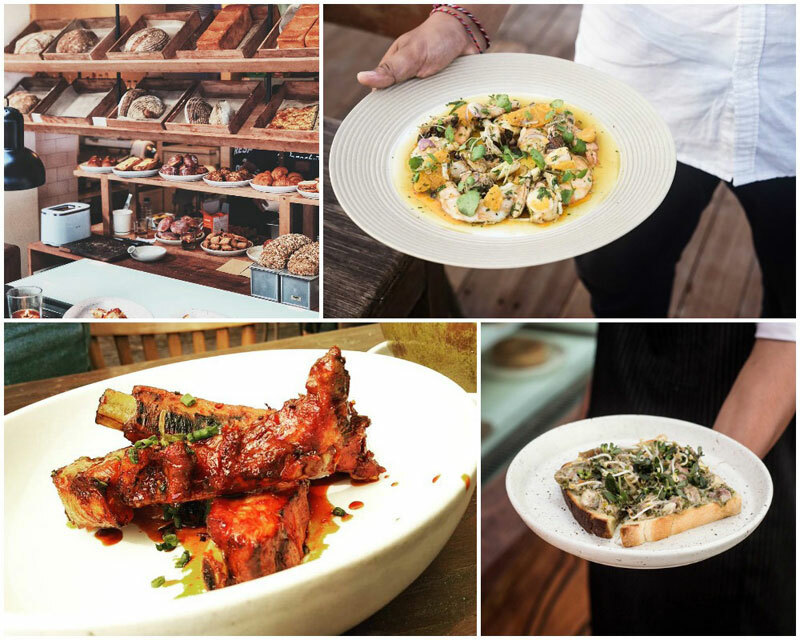 You’ll leave with a smile and a satisfied tummy. Entrance Fee: Rp. 30,000 for locals (Approximately USD $2.13) and Rp. 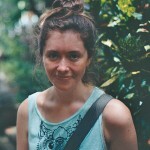 75,000 for foreigners (Approximately USD $5.34). 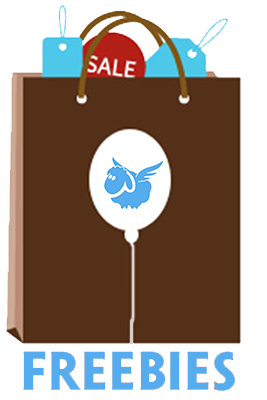 Entrance fee can be used to redeem beverages or gelato. 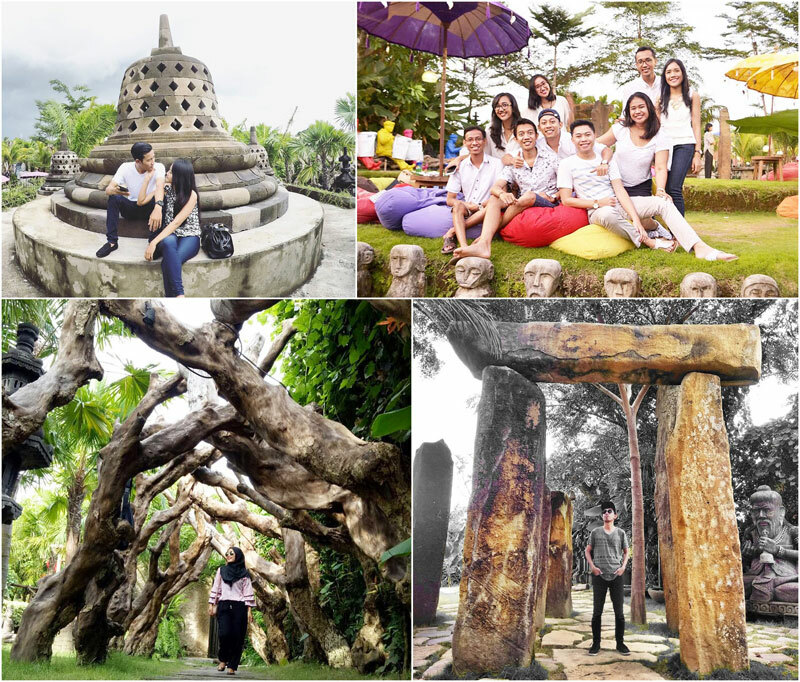 Bali is so much more than beaches and parties. 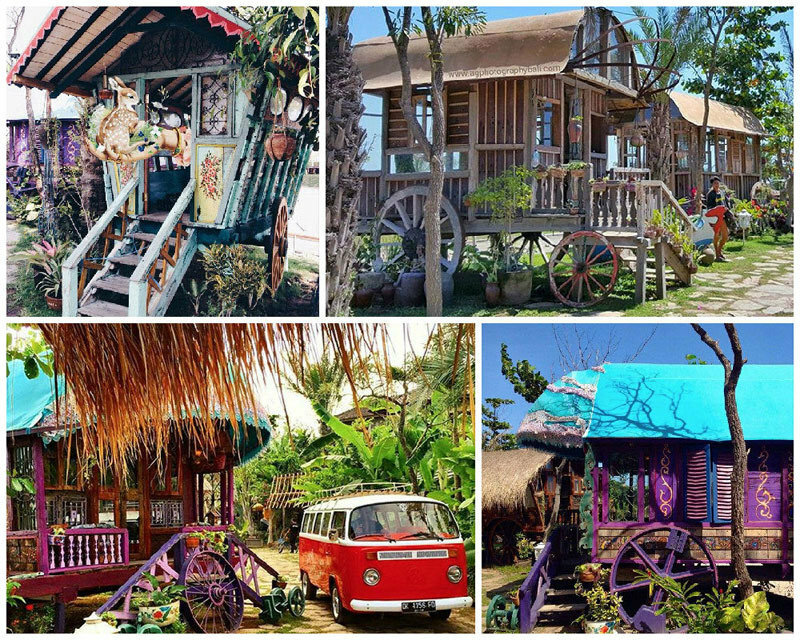 Who says it can’t also be a place where you can find inner peace? 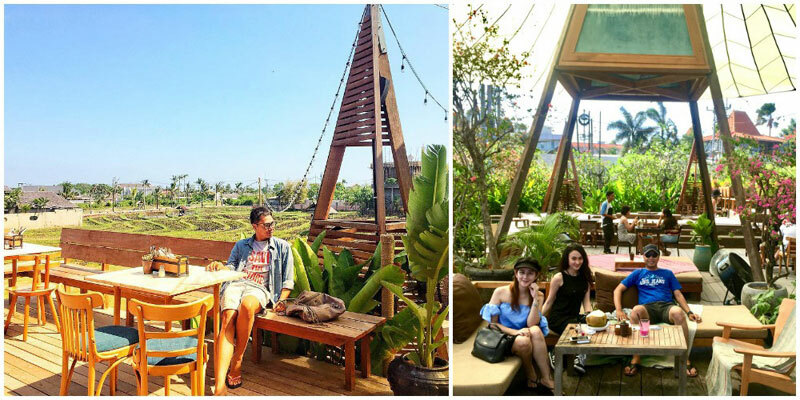 Imagine wind-blown paddy fields with a cup of tea – that’s what you can see from Pomegranate, a cafe started in 2012 by a pair of Japanese brothers. 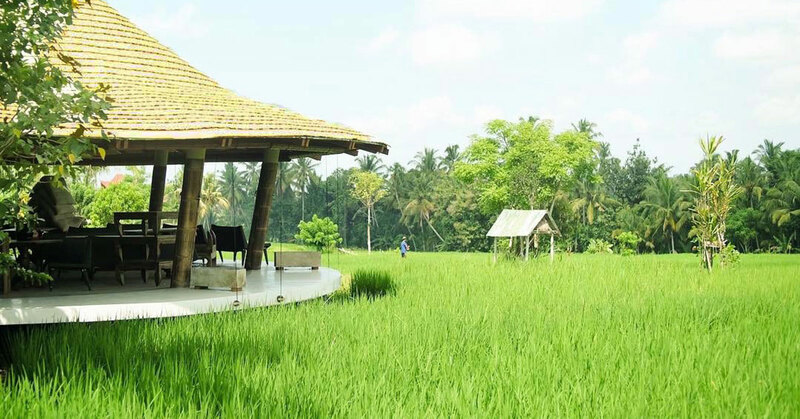 It offers a 360-degree view of lush paddy fields in Ubud that stretches all the way to the Campuhan River. If you come in the mornings, you can also see the majestic Mount Agung in the Northeast and Mount Batukaru in the Northwest. 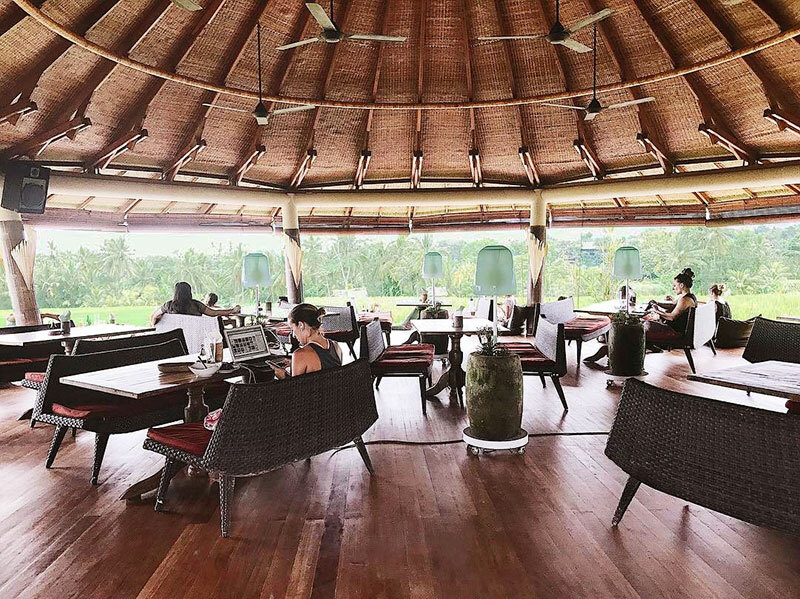 In the evenings, you’ll be greeted by fireflies and the glimmering lights of village houses in the distance while you enjoy some of their delicious pizzas. Remember to bring flashlights though, because there are no streetlights in the area. 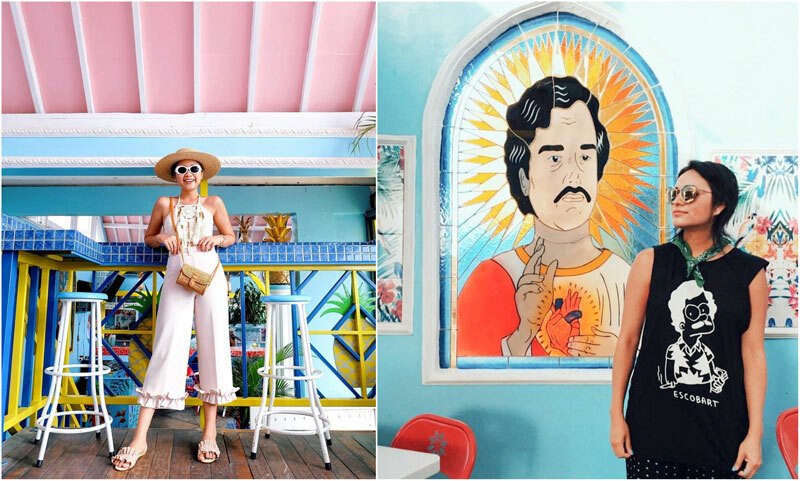 If you’re feeling like a little taste of elsewhere, why not try a unique place that will make you feel like you’ve stepped into the heart of Latin America? 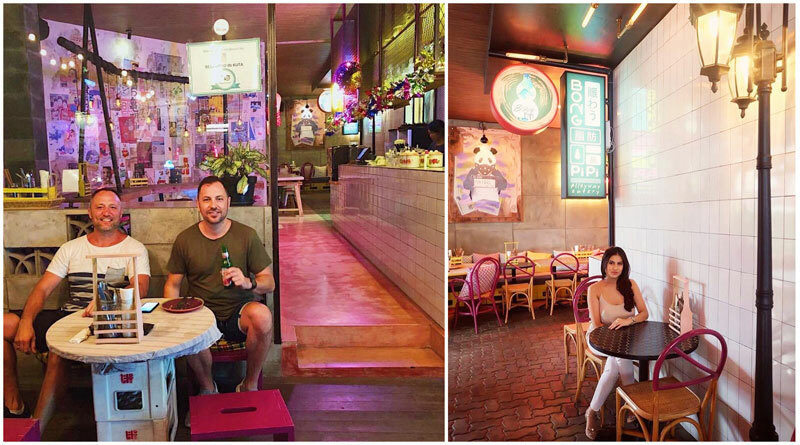 Pablo’s, with its brightly-coloured and vibrant walls, artwork, and decor, is a perfect place to eat, relax, and take a few snapshots for Instagram. Because where else will you see portraits of Pablo Escobar depicted as Jesus? Ready to eat? You will definitely want to try one of the pizzas, and as with all their dishes, the food is made with a Colombian twist. Combine your meal with a fruity and delicious cocktail and you’re good to go! 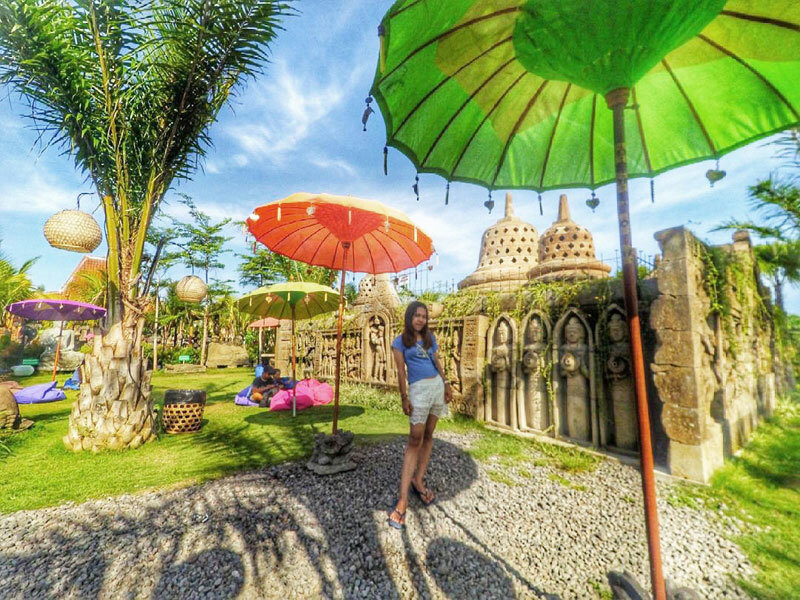 You can rewind to that era (yes it’s a long-gone era we miss) at Bong Pipi Bali. So if you’ll feeling a little nostalgic and missing the old times, spend the day gaming at old school gamestations, only that now you get to play modern Playstation games on it! Try to beat your friend’s highest score! 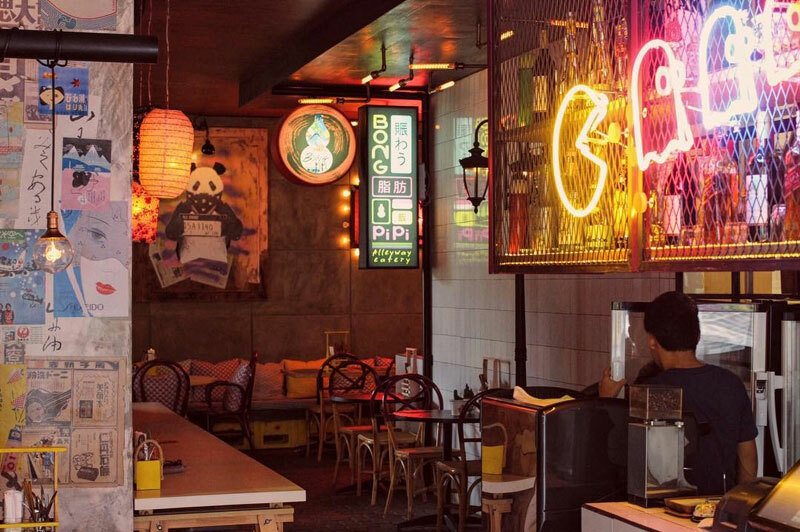 With the funky neon lights, it’s so easy to forget that it’s not the 80s’ or 90s’ anymore. And when you get hungry from playing, you might actually recall that this is a cafe. Try the delicious pork tacos and fries or delightful pancakes. We wish we had such lovely snacks when gaming in the past! 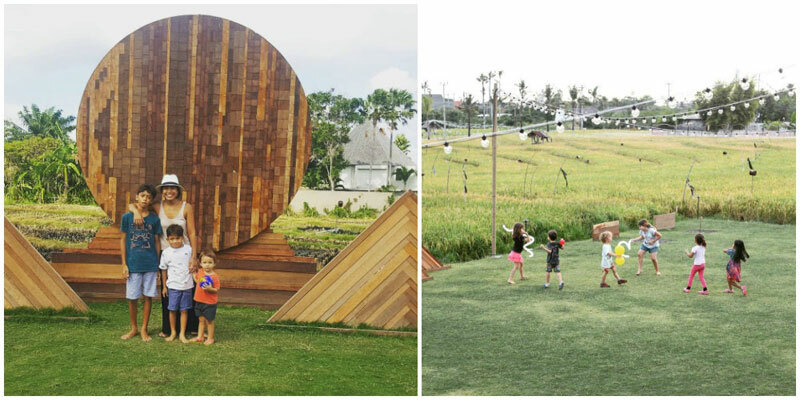 Or, if you just want to get in touch with the real world and have a relaxing time, head down to Nook Bali. 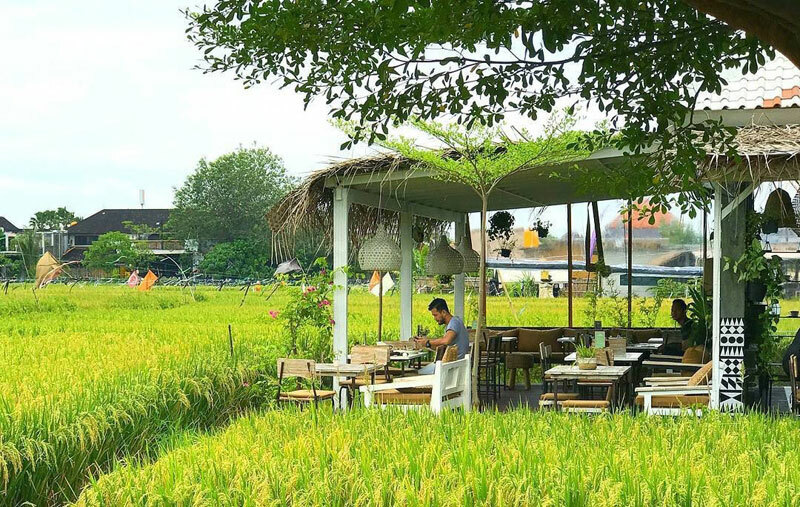 This simple, rustic cafe is located between rice fields, and will offer you the precious experience of dining while surrounded by gorgeous views of greenery. 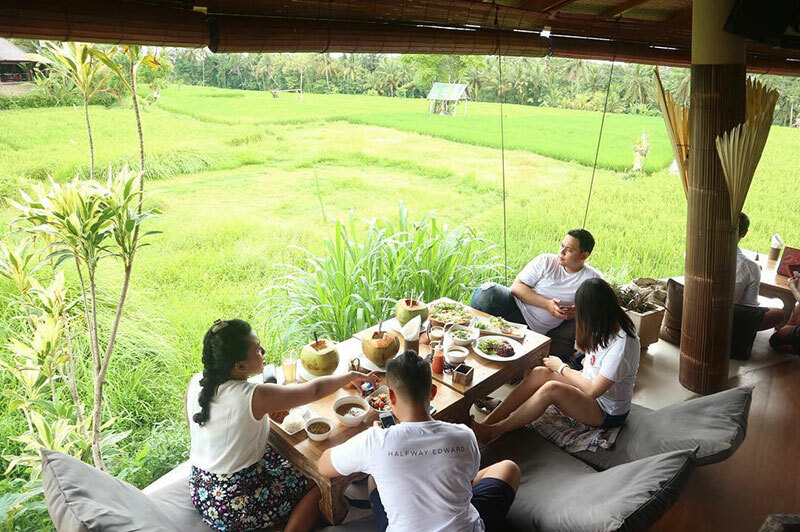 Better yet, the food is incredibly affordable – try out traditional Balinese food such as Nasi Mix, or Western dishes like Quinoa and Kale Breakfast Bowl! 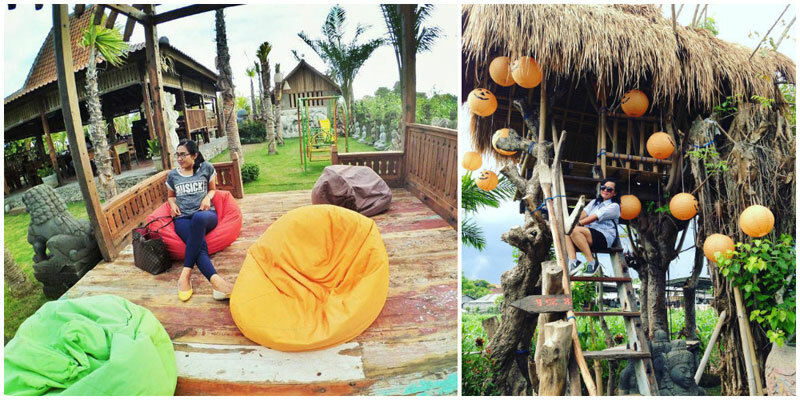 Are there any more awesome unique cafes that we missed out? Do share about it with us below!